on Originality - Index . Assembly Plants and Bills of Sale . The daily records documenting the dates of production of the Ford Model A Engine from 1927-1931! 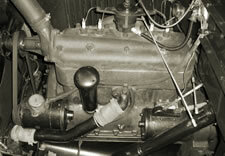 Click here to learn when your engine was built. Welcome to a Global Model A Ford Research and Information Project! What I am presenting to you in this web site, are a series of projects and data bases regarding the Ford Model A automobile. "Those Mysterious Holes....The 1928 Tudor Windlace"
What I am requesting from you, the Model A Ford hobbyist, is to provide what information you can to enhance the data base studies within this site. Everyday, more and more information is lost and that is something we must try to prevent and not let this information slip away from us. The following items are things I am looking for to do future studies to incorporate into The Restorer or Model A News or just to have in my collection of Model A Ford memorabilia. Universal joint housing outer caps, upper and lower halves. The upper half must have the part number of A-4517-B1 and the lower half must have the part number of A-4514-B1. 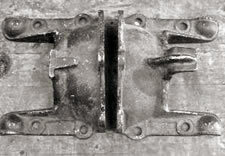 These part numbers are either raised, indicating a forging, or stamped into the part itself indicating a casting. There are “B2” parts but I need the “B1” parts. 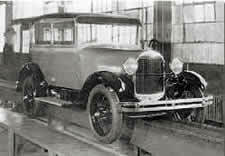 A 3 record set which are the “demonstration lectures” concerning the Model A Ford. May also be called “All About the New Ford”. These records were prepared by the Ford Motor Company and were listed in the January, 1928 Ford Dealer and Service Field Vol. 29, # 1, page 41 and 44. They are double faced 10-inch discs which were excellent in training the Ford salesman. They were recorded by the Individual Recording Company in Cincinnati, Ohio. Copies of “Ford Dealer and Service Field”, 1928-1931. If you have any of the items listed, please Email Me. Please check out the site and if there are some things which you can contribute to, please let me know. I hope that this will be a useful aid to you and your restoration. For more information on how you can assist in this ongoing project, please feel free to get in touch with me by simply clicking on this link Email Steve. The following study concerns the 1928-1931 Model A Ford Universal joint housing caps- inner and outer assemblies (and related parts) along with it's counter part, the Transmission main shaft bearing retainer. Click here to learn more about this integral part of the Ford Model A. So, I've designed and created a scale model of the Ford Model A Production Assembly Line. Click here to learn more and to view pictures of this project. ©2003-2015 Steve Plucker. All Rights Reserved. Registered trademarks remain the property of their respective owners.